I have strong feelings for the New Zealand landscape, and think that most of my work so far reflects this. When I paint, I try to express my personal impressions as much as the visual image itself, so that when the work is finished I can see something in it that expresses what I felt in some way. I hope that others can see it too. I generally paint in oils, but sometimes work with other media to see what different results I can achieve. I enjoy the complex interplay of colour, especially when a lot of quite vivid and unrealistic colours are used in close proximity to give an overall lively impression of a realistic colour. 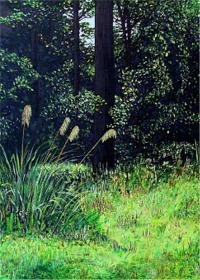 My painting (left) of the Kaitoke Regional Reserve, north of Upper Hutt painted some years ago was probably the first time that I consciously worked at achieving this approach. In the image below, you can see a little more clearly how I added reds in areas of green, and violets in predominantly yellow and brown areas. It is more obvious on the original.